Usually silent, calls are quiet and heard at close distances. 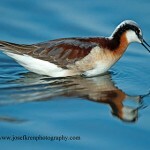 The Buff-breasted Sandpiper is a medium-sized bird. It has a short, pointed, black bill, rounded head and it has long yellow legs. It is considered buffy all over and the wings have white undersides. There are small black spots on the crown and back. 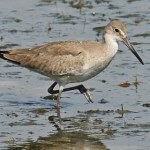 Behavior: During their spring migration stopover, Buff-breasted Sandpipers spend most of their time foraging in corn and soybean fields, sometimes following behind farm equipment as fields are being worked and planted. Wetlands are visited for bathing and drinking. Compared to other migrating shorebirds, Buff-breasted Sandpipers spend less time foraging and more time in courtship interactions. The male Buff-breasted Sandpiper will attempt to attract females in two ways: the double wing courting display and the single wing flash. Habitiat: Buff-breasted Sandpiper is most frequently found in corn and soybean fields, but also in grazed pastures and Rainwater Basin wetlands. Nebraska Seasons: Rare spring and fall migrant across the state. 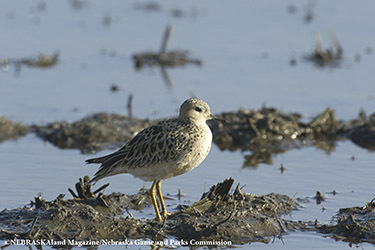 Where Seen: Buff-breasted Sandpipers do not breed in Nebraska, but a large proportion of the global population of the Buff-breasted Sandpiper stops over in the eastern Rainwater Basin region in the spring. 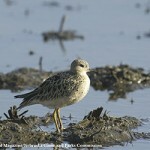 Field Notes: Longer, thinner neck and longer legs make this bird distinctive in a mixed flock of shorebirds. Buff-breasted Sandpipers can travel 18,000 miles in a single year between their wintering grounds in southeastern South America and breeding grounds in the North American Arctic. Conservation status: Buff-breasted Sandpiper is a Nebraska Bird Partnership priority species for conservation. They have been known to travel 18,000 miles in a single year between their wintering grounds in southeastern South America and breeding grounds in the North American Arctic. “Buffies” are a lekking species; males gather on a lek each breeding season to compete for females with courtship displays. Males are sometimes seen displaying during the spring migration.